People who find it difficult to clear nicotine from their body may be more vulnerable to getting hooked on smoking, research suggests. 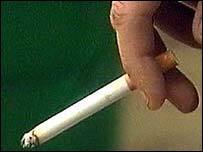 Scientists found people who carry a gene mutation which slows this process are more likely to find it tough to quit smoking. The effect was especially strong in new young smokers who carried rogue versions of the CYP2A6 gene. The research is published in the journal Tobacco Control. This research shows once again that for some smokers, nicotine is horribly addictive. The researchers analysed data from almost 1,200 13-year-olds in Quebec, of which 228 smoked, but were not yet addicted when the study started. During the two year period of the study 67 of the smokers ended up fully hooked on nicotine. Genetic analysis showed that dependency was significantly more likely in those who carried one of two faulty versions of the gene, both of which sabotages the ability of the liver to break down and remove nicotine from the system. They were almost three times as likely to become addicted to tobacco as those with the normal variants of the gene. People who carried partially inactive variants of the gene were not at increased risk of becoming addicted. Students with the normal gene smoked an average of 29 cigarettes a week. Those with the partially inactive variant smoked 17. But those with the inactive variant, which slowed down nicotine clearance the most, smoked around 12 cigarettes a week. The authors suggest that slow clearance prolongs the exposure of the brain to nicotine and is likely to make it more intense. This may increase the likelihood of addiction - and reduce the number of cigarettes required to achieve it. Thus, although young smokers who carry the faulty genes are likely to smoke less, they are also likely to find it more difficult to give up. Previous research has shown that it is much harder for those who become chemically dependent on nicotine to quit smoking. In March, Oxford University researchers pinpointed variations of a gene that controls dopamine, a brain chemical associated with feelings of pleasure, as playing a key role in smoking addiction. Women who had a minor variant of this gene were only half as likely to quit smoking and stay off tobacco, in an experiment that involved nicotine patches. Dame Helena Shovelton, chief executive of the British Lung Foundation, said: "This research shows once again that for some smokers, nicotine is horribly addictive and therefore difficult to give up. "About 450 children start smoking each day - these are appalling statistics - especially when you consider this research suggests that young smokers get hooked more easily." Professor John Britton of the British Thoracic Society said: "This study is further evidence of the crucial role played by nicotine in establishing a lifelong and lethal addiction to cigarettes. "Our focus must be to prevent young taking from up smoking in the first place, and evidence suggests the best way is to drive down the prevalence of smoking in adults."